Congratulations to Lana B., the winner of the Whatever Goes Giveaway hop here. She's already responded to my request for mailing information, so her prize pack full of Symbolic Imports will be going in the mail today. Lana's favorite food smell is pumpkin pie. That's a pretty good one in my book. If you entered, but didn't win, never fear, there's many more giveaways to be had before the end of the year. I hope to do one a week starting the week of Thanksgiving. There will be sewing patterns, fabric, crafty little things, and more! So, keep checking in to see what you can win. 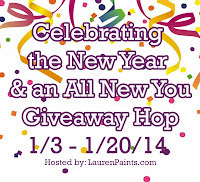 I've also signed up for Lauren Paints A Beautiful Life's New Year & an All New You hop which is running from January 3 to January 20. If you're a blogger and would like to sign up, just click the picture below and follow the directions. Hope you're all having a good Tuesday. It was 18 degrees out when I came home from work last night. I don't think I'm ready for winter yet, but I guess it's coming whether I'm ready or not.